It's no secret that women love their shoes, but it can be a love-hate relationship when discomfort sets in. From burning pains in the balls of your feet to sore blisters on your heels, wearing your favourite pumps can result in prolonged damage to your lower limbs. A new range of shoe care products has been launched across Australia aimed exclusively at women, providing fashionable comfort and protection in any shoe style. The Miss Minit range, launched by Mister Minit, will include cushions, gel pads and heel grips to alleviate discomfort, as well as water & stain protectors, polish pens and shoe shine cloths to help you maintain the lustre of your precious shoes and handbags. 'We wanted to create a stylish range that helps to ease the discomfort woman often feel when wearing high heels and Miss Minit is designed specifically for the modern, well-heeled woman who could do with extra comfort," says Kylee Young, Mister Minit Shoe Care Expert. So next time you throw on your heels, consider these shoe care products to ease your feet along. 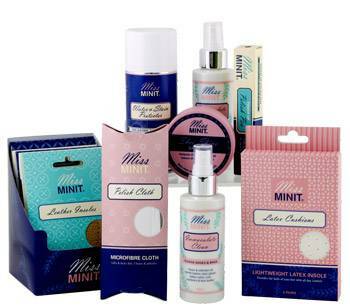 For the full range of Miss Minit products, RRP and product features, please see below. Prevent those painful heel blisters. Increase the grip of loose-fitting shoes, provide padded comfort and reduce heel blisters. Provide invisible cushioning to prevent the burning pain in your heels. Prevent the pain of shoes rubbing and sling backs slipping. Helps to prevent burning pain in the balls of your feet. Breathable, genuine leather helps your feet stay cool, dry and odour free. Lightweight, latex cushioning insoles that provides comfort all day long. Protect your favourite shoes, boots, bags and clothing from water and oil based stains. Clean and shine all colours of leather and patent leather instantly. Clean and refreshes all smooth leather, vinyl, plastic rubber, nylon, cork, synthetics and faux leather. Instantly repairs scuffs and scratches on shoes and heel. Polish more effectively, reaching into surface pores and crevices. Polishes better than a cotton cloth! Miss Minit is available at Mister Minit 254 stores nationally to find your closest Mister Minit location, visit www.misterminit.com.au.